Kung Fu Factory and Nickelodeon have teamed up once again to bring you another fun and exciting mobile title: SpongeBob Moves In. Dive deep into the sea and create your very own Bikini Bottom! Experience unique underwater quests alongside familiar faces such as Patrick, Squidward and Gary. Practice Karate while you unlock exclusive mini-scenes, written in collaboration with Stephen Hillenburg, and real character voice overs. 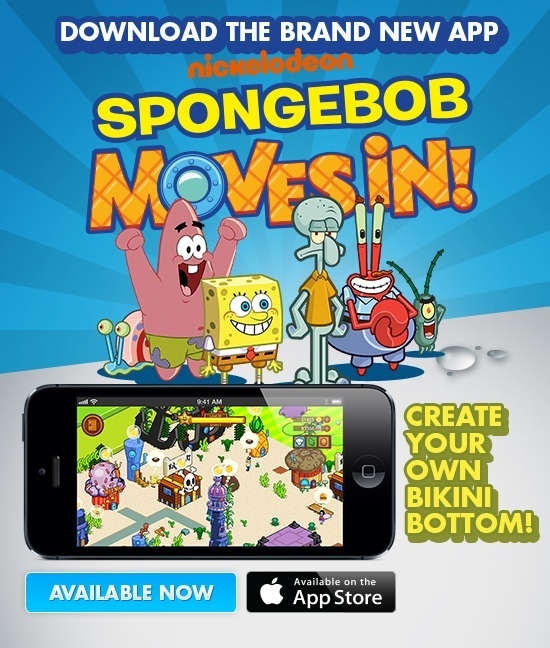 SpongeBob Moves In is now available for iOS 4.3 or later on the App Store! Hi, I have been playing Spongebob moves in since it was released. Unfortunately, my old Ipad is having a hard time handling this game, as it crashes every 3 minutes and takes a long time to load. I tried it on a friend’s Ipad Mini with retina and it was awesome, so I suspect it may be due to the first generation’s Ipad hardware limitation. My question is: Will this game ever be available for Android OS? Because I am sure that my android device will handle it easily. I wouldn’t mind buying it again and starting over if it means I could play the game without crashing every few minutes. Gerald, the four year old iPad 1 is very limited in memory so as new content is added to the game each month it becomes harder and harder to handle. Please contact Nickelodeon customer support and find out their release plan for the Android SKU. Previous Post: Konami and KFF Team Up! Next Post: Spartacus Legends Unleashed!